Check out our fantastic new Nyan Cat T-shirts. Adult sizes are available, and we have the T-shirt in a standard cut (below) and a fitted women's cut (below below). 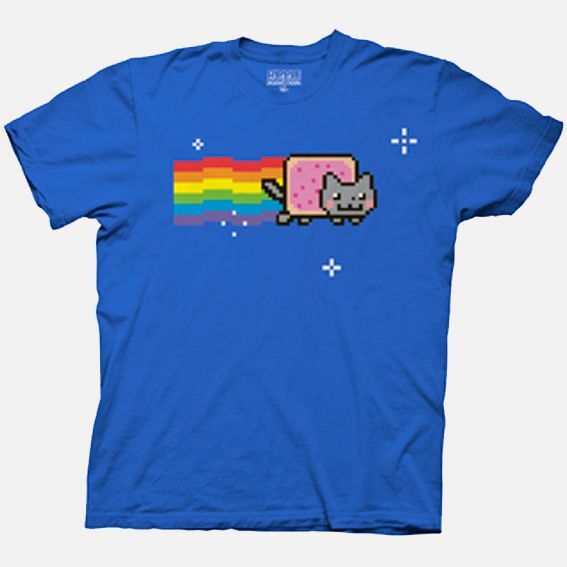 They are both officially licensed Nyan Cat products printend on high quality 100% cotton. Both come in a very bright blue, which is great as they have arrived just in time for the start of the British Summer (which must be due to start up again any day now!). Nyan Cat is the name of a character featured in an internet meme, which went super mega viral at some point in 2011. 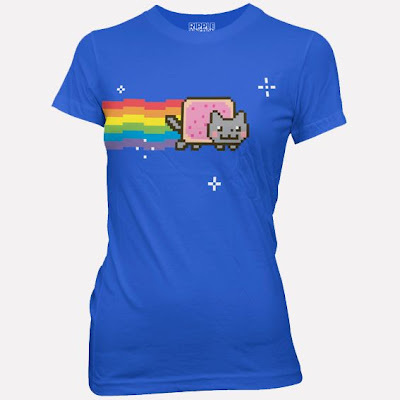 It takes the form of an animated GIF or a Youtube video, depending on your persuasion, and is basically an 8-bit cat with a pop-tart body flying through an endlessly repeating expanse of space with a pixel rainbow trailblazing behind. As you do. The Youtube video (see below) also comes with an appropriately nuts theme tune, and one version goes on for 10 hours. It's had almost 100 million views at the time of writing!